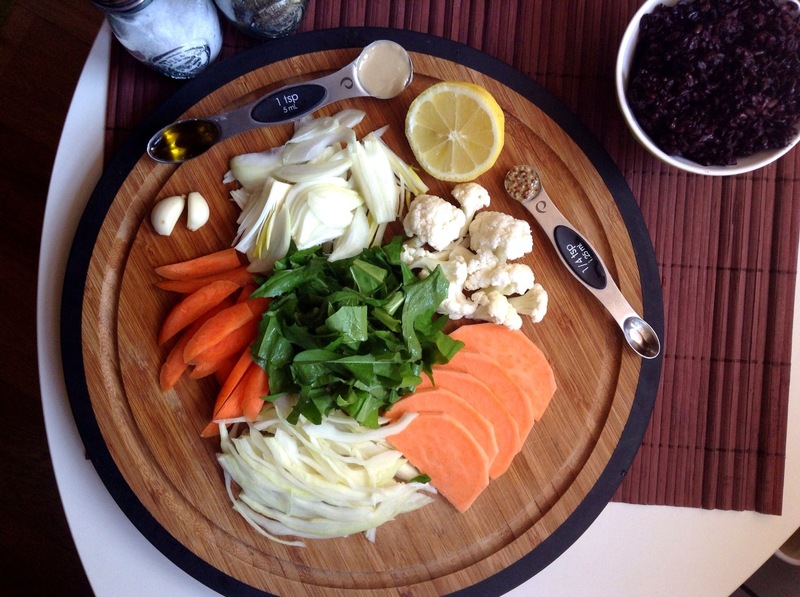 This One Dish Macro Meal is delicious, nutritious and balancing. It’s packed with flavour and nutrients and will satisfy your hunger any day of the week for lunch or dinner. It requires some prep work, but it’s super easy. Pictured above is my One Dish Macro Meal from Sunday night’s dinner; Black Rice in a Lemon, Mustard, Tahini Dressing with Oven Roasted Veggies, Sauteed Greens and Caramalized Onions. So good in fact that I remade it for lunch today with the leftover rice. In case you’re unfamiliar with it, Black Rice, also known as Purple Rice or Forbidden Rice has similar characteristics to brown rice and comes in many varieties. It is very aromatic, has a rich nutty and almost floral flavour profile and is generally more chewy than brown rice. As the name denotes, it is a deep black colour which turns into a deep purple once it is cooked. Legend has it that this rice was once consumed exclusively by Emperors in China, and hence why it is also referred to as Forbidden Rice. 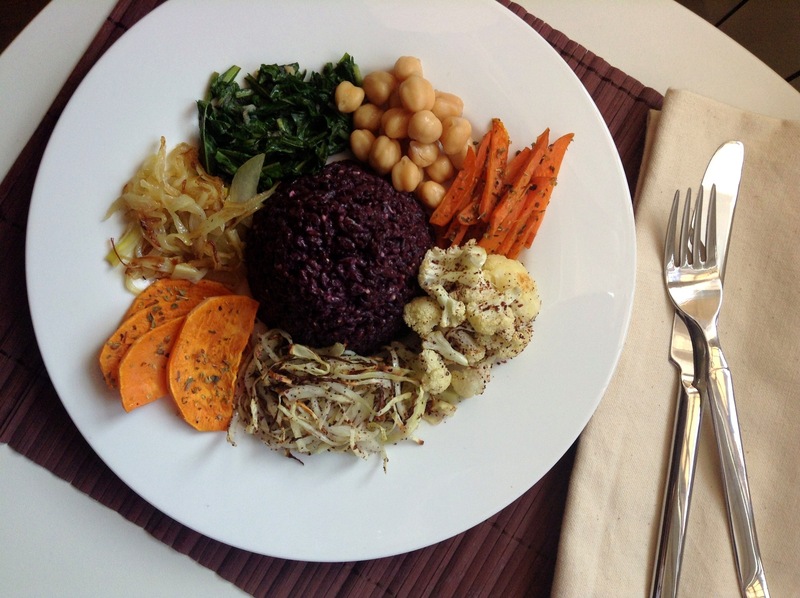 Black Rice is rich fiber and iron with the added benefit of anthocyanins (water soluble antioxidants) that are also found in blueberries and other similarly coloured fruits and vegetables. I was first introduced to Riso Venere, as the Italians call it, by my husband here in Italy two years ago. I had never tried it, nor seen it in supermarkets in Canada, but here it is quite a popular menu item. Like regular rice, it also comes in refined and whole grain format, so be sure to select Whole Black Rice when you are buying it, as you want the added benefits mentioned above. Riso Venere just happens to be hubby’s favourite grain (with brown basmati in second place), and so it’s my go to grain when I want to make a simple macro meal, as I know he’ll enjoy it more. 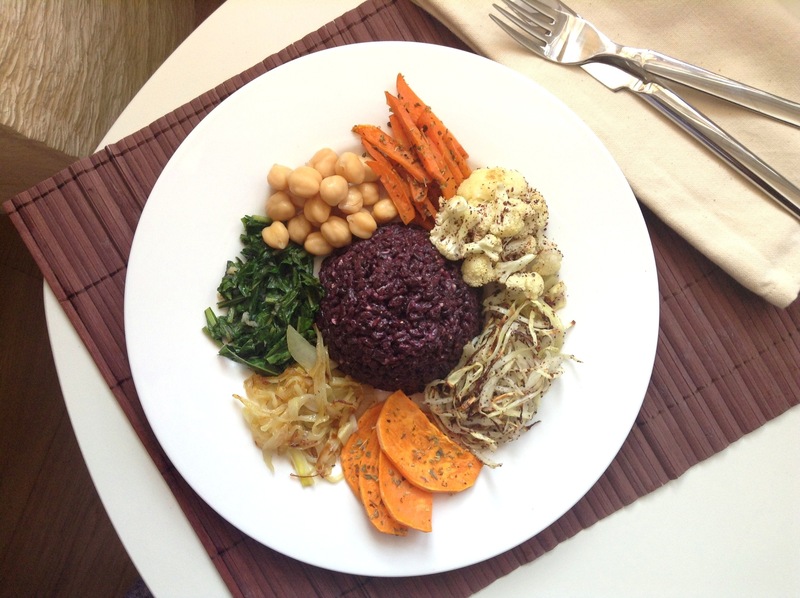 The ideal macrobiotic meal should be made up of 50-60% whole grains, 25-30% vegetables and 5-10% beans and legumes, and 5% soups. This One Dish Macro Meal fits the bill. Serve it with a bowl of Miso Soup and you’re good to go. You don’t really need a recipe for this as it’s so simple and versatile that measuring is not essential. Here is an easy step by step guide to creating a one dish macro meal of your own (but if you need more guidance, scroll to the bottom for a complete recipe on how to replicate the dish in these pictures). Chose your favourite whole grain (whole black rice (not glutinous or sticky rice), brown basmati rice, quinoa, soba noodles, etc…) and cook it according to package directions. Chose your favourite vegetables. To keep this truly macrobiotic, be sure to chose a vegetable from each of the following groups; round vegetables, root vegetables, and leafy greens, and avoid the nightshades (to read more about nightshades, visit my Kitchen 101 section on Fresh Foods: Fruits & Vegetables). Slice and dice your vegetables, then grill, roast, sautée or steam them as you like with a drizzle of olive oil, sea salt and your favourite herbs and spices. Chose your favourite bean and/or legume (chickpeas, cannellini beans, lentils, black beans, etc…). Since beans take a long time to cook, you want to plan ahead for this and make them the day before. Alternatively, you can use beans from a jar (preferable to those in a can). Prepare a sauce or dressing. There are an aray of condiments to chose from, starting from lemon juice, tahini, umeboshi plum vinegar, mustard, and then some. Blend them all together and add a pinch of salt, garlic, herbs and/or spices. Assemble. Toss cooked grain in the prepared sauce or dressing to coat completely and then place grain in the middle of the dish. Surround the grain with the cooked vegetables and serve warm. Place carrots, sweet potatoes, cauliflower and cabbage on a lined cookie sheet or oven safe tray. Drizzle with a little bit of olive oil and sprinkle with a pinch of sea salt. 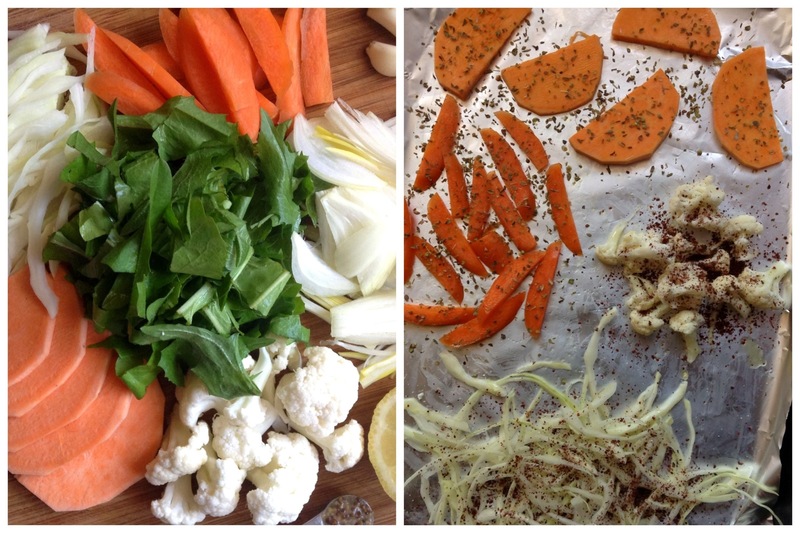 I added Oregano to the carrots and sweet potatoes, and Sumac to the cauliflower and cabbage. Roast in a preheated oven for 10-15 minutes on 220 C.
Heat 1 teaspoon of olive oil on low heat, add onions, sprinkle with a pinch of salt and sautée until carmelized. This brings out the natural sweetness of the onions. Remove from pan and set aside. In the same pan, without adding any additional oil, add crushed garlic and sautée for 1 minute. Add dandelion greens and sautée until slightly wilted but still vibrant in colour. Remove from heat and add 1/2 teaspoon of umeboshi plum vinegar. Combine all dressing ingredients in a small bowl and mix. 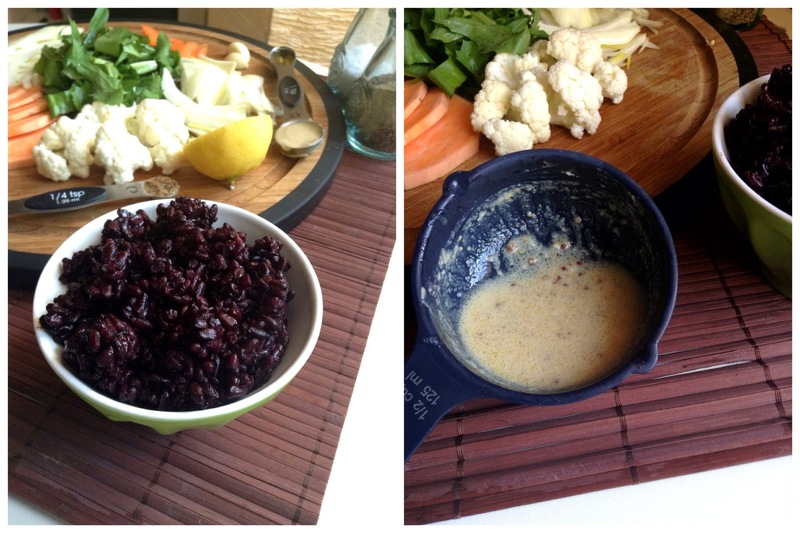 Toss 1 cup of black rice with the dressing and place in the center of the dish.